Many campsites now have electric hook-up (EHU) on their pitches. This provides a source of mains electricity for your caravan allowing you to run lighting, refrigerators, water heating, appliances, etc. Most pitches with EHU do not charge for the amount of electricity used, as this is included in the pitch price. Although sometimes lower, generally in the UK the current limit is 16Amps (approx 3.7KW). To connect to the power supply on site, use the electric connection supplied with all new caravans, or purchase a new one from a reputable caravan dealer. Please note; the infrastructure at most campsites is not designed to continuously supply the maximum power to all pitches, so please be mindful of this and limit your electric use during peak hours. Check the trip current limit at the EHU bollard and ensure that any equipment, or combinations of equipment you intend to use will not exceed this current. Please be careful, electricity can kill. If you are unsure or if you have any doubts ask the site warden to help. 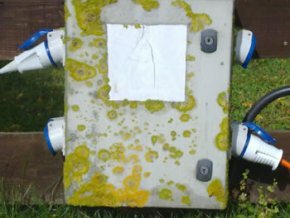 Though lichen covered, this EHU worked well and safely. First, check that the mains isolation switch in your caravan is off, and that all installed and portable electrical appliances are switched off. Uncoil your electrical cable, checking for any signs of damage to the insulation or connections. If either is damaged, replace it with a complete new cable, or seek advice from a qualified electrician. The electric cable, stored in a cable drum. 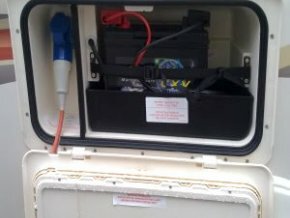 Locate the mains inlet on your caravan that may be mounted directly through the caravan wall, or placed within an external battery box, open the cover and insert the female connector. The mains inlet. Always inspect for damage and be careful. Find the electricity supply bollard that has been assigned to your pitch and raise the cover on the individual outlet. Visually inspect the socket for any obvious signs of damage. If you are happy that the socket looks good and is in safe working order, if the trip switch is accessible, turn this off and then connect the male end of your cable. Turn the trip switch back on. If the trip switch is not accessible, plug in, and if the circuit trips, you should consult the site owner or warden. There should be a locking mechanism for the plug. This may be achieved by rotating the plug, which also acts as an on/off switch, or the plug cover may clip over a small locating lug to retain it in position. Check that the cable is located securely before leaving the socket. Disperse any unneeded cable length beneath the caravan in large loose loops. If the cable is tightly coiled it can overheat, melt the insulation and cause a short circuit and/or start a fire. Switch the caravan mains isolating switch back on and check that the circuit breaker (or RCD – Residual Current Device) is working by pressing the test button. Reset and you’re now connected. A useful bit of advice which could save you a lot of money. 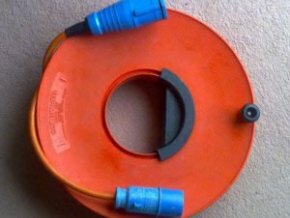 NEVER connect the mains lead until AFTER you have filled the water system using the on board 12v battery supply. We all forget at one time or another to switch off the water heater, and connecting the mains supply before filling the system will cause the heater to either trip out or burn out the electric heater element. When getting ready to leave the site, unplug the electric BEFORE draining the water heater. Doing this will save you draining with the heater still on. When ready to leave, check all switches are OFF. Turn off all appliances, then switch the caravan mains isolating switch off. Either manually turn off the trip switch at the bollard and remove the male plug, or operate the button or lever allowing the male plug to rotate to a position where it can be removed. Disconnect the female plug from the caravan and close the cover. Either loosely coil the cable, or wind it onto a cable drum designed for the purpose, ensuring that there are no kinks in the cable, and store it safely.